Hartford, CT — The annual census of homelessness conducted on January 24th shows a third straight year of declining homelessness and the lowest homeless count recorded in Connecticut since 2007, according to the Point-in-Time (PIT) Count report released May 18th. TOTAL HOMELESS POPULATION LOWEST COUNTED IN CONNECTICUT: 3,387 total individuals counted, a 13% decrease from last year and a 24% decrease from 2007. CHRONIC HOMELESSNESS DROPS SIGNIFICANTLY: The number of chronically homeless individuals (experiencing long-term homelessness and living with disabilities) decreased 60% since 2014; down 11% since 2016. MOST CHRONICALLY HOMELESS ON THE PATH TO HOUSING: Nearly 60% of those counted as chronically homeless were in the process of securing permanent housing. 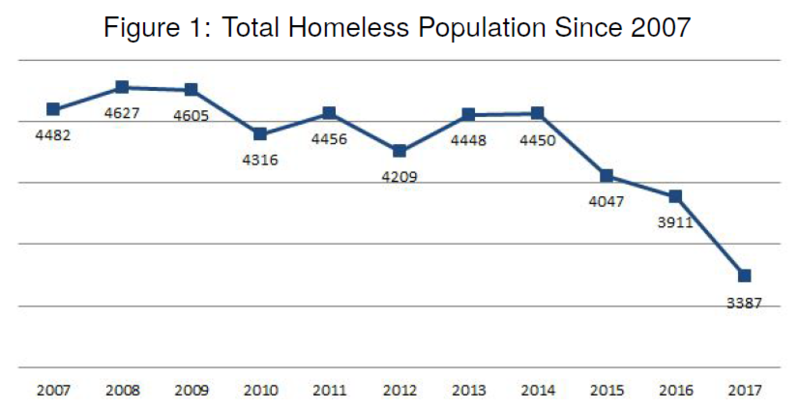 UNSHELTERED COUNT DROPS SHARPLY: 415 people were unsheltered – a 38% decrease from last year. FEW VETERANS COUNTED AS HOMELESS: only 34 Veterans were identified in emergency shelter: a decrease of 24% since 2016; only 14 Veterans were unsheltered — a decrease of 67%. CT continues to house homeless veterans in about 90 days. NUMBER OF HOMELESS FAMILIES FALLING: 392 families were experiencing homelessness, a decrease of 13% from 2016. 4,396 YOUNG ADULTS EXPERIENCING HOMELESSNESS: 4,396 young people under the age of 25 were experiencing homelessness or housing instability across Connecticut. The January 24th count, coordinated by the Connecticut Coalition to End Homelessness (CCEH), showed that overall homelessness in Connecticut is down 13 percent compared to 2016, and down by 24 percent since 2007, the first year the census was conducted statewide. The 2017 count represents the lowest totals ever in a statewide CT PIT Count for individuals, families, veterans, and chronically homeless. Surveyors identified 3,387 individuals experiencing homelessness (down from 3,902 in 2016,). The continuing decline follows major investments to end homelessness by the administration of Gov. Dannel P. Malloy and the General Assembly, in tandem with concerted efforts to coordinate and target resources at the community level. Connecticut’s work has earned national acclaim: the federal government confirmed in 2015 that Connecticut had effectively ended chronic homelessness among veterans. In 2016, Connecticut became one of the first two states to end all veteran homelessness by securing housing in less than 90 days for any veteran identified as homeless. “Along with Governor Malloy, our communities have embraced the goal of ending homelessness – not just managing it. Three years in a row of declining numbers of homeless in our shelters and on our streets proves that our efforts are working,” said CCEH Executive Director Lisa Tepper Bates. The number of chronically homeless (those experiencing long-term homelessness and living with severe disabilities) decreased 60 percent since 2014, and is down 11 percent since 2016. Starting in 2015, partners across the state have mounted a concerted effort to identify and house those experiencing this most severe form of homelessness. In just two years, Connecticut has housed more than 1,441 of these high-need, long-term homeless individuals. “This substantial drop in chronic homelessness is a direct result of the collaboration across state government, nonprofits, and federal resources to coordinate our efforts and target our resources to the most vulnerable people experiencing long-term homelessness,” said Evonne Klein, Commissioner of the Connecticut Department of Housing. People who are chronically homeless tend to cycle in and out of expensive public services, like emergency departments, hospital in-patient care, and jails – racking up high costs while their homelessness persists. Studies across the nation show that communities can decrease costs by up to 70 percent when they house this population with appropriate supports. “Ending chronic homelessness is a wise investment that saves lives and saves public funds,” said Alicia Woodsby, Executive Director of the Partnership for Strong Communities and the state coordinator of the Reaching Home Campaign to end homelessness in Connecticut. The count identified only 34 Veterans in emergency shelter (a decrease of 24 percent since last year); only 14 Veterans were unsheltered (a decrease of 67 percent from last year). “We cannot ensure that no veteran will ever be homeless again,” said Debbie Deegan, Director of VA Connecticut’s Errera Community Care Center. “We continue to reach every veteran experiencing homelessness quickly, and offer them appropriate housing with a target of 90 days or less. “Family homelessness decreased 13 percent from 2016, with a count of 392 families experiencing homelessness. Only 415 people were counted as “unsheltered,” representing a 38 percent decrease from last year. Connecticut’s second count of homeless youth showed some 4,396 unaccompanied youth age 24 and under experiencing homelessness in our state including 269 counted as literally homeless in the PIT. “We have made great progress ending the homelessness of key populations,” said CCEH’s Bates, “We need to carry forward that momentum, teamwork, and innovation to end the homelessness of vulnerable youth in our state.” The first statewide count of youth homelessness conducted by CCEH in 2015 estimated some 3,000 young people homeless or severely housing unstable. For the 2017 youth count, Connecticut adopted emerging national best practices and improved methods of reaching homeless youth (including the use by surveyors of counting app created pro bono by Microsoft), increasing accuracy in the count reflected in the higher estimation. The annual Point-In-Time Count, completed each winter by an army of volunteers, is required by the U.S. Department of Housing and Urban Development to take a snapshot of homelessness in every state across the country. The Connecticut count is coordinated by the Connecticut Coalition to End Homelessness. The count includes all people (adults and children) experiencing homelessness in shelter and unsheltered – living in places not meant for human habitation such as abandoned buildings and under bridges – in addition to those in emergency or domestic violence shelters and transitional housing programs. The 2017 Point-in-Time Count and Youth Count were generously funded with support from Citizens Bank, the Connecticut Department of Housing, the Department of Mental Health and Addiction Services, the Department of Correction, the Department of Social Services, the Court Support Services Division, the Department of Veteran’s Affairs, the Connecticut Housing Finance Authority, the Department of Children and Family Services, Fairfield County’s Community Foundation, Farmington Bank, the Hartford Foundation for Public Giving, the Melville Charitable Trust, the Office of Policy and Management, and Opening Doors-Fairfield County. Keep up-to-date on our advocacy and programs with our Monthly Newsletter.